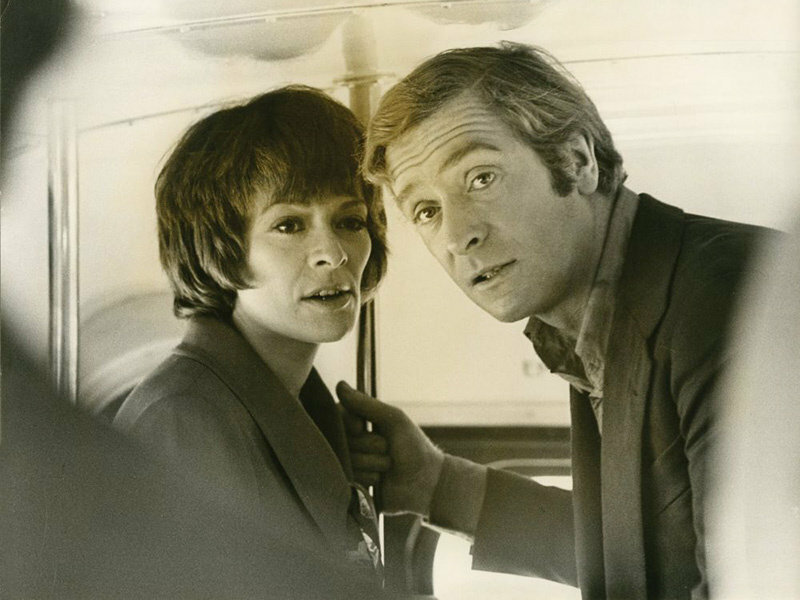 Don Siegel's crime thriller The Black Windmill starring Michael Caine, now on Blu-ray via Kino Lorber, is a meta-commentary on adults behaving badly. 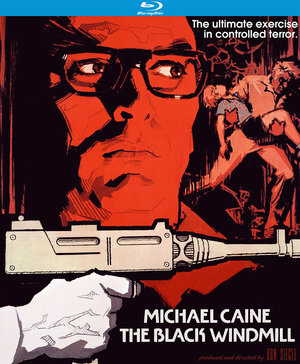 Fans of director Don Siegel and actor Michael Caine will make haste to sink their teeth into The Black Windmill (1974), which has been pretty much missing in action since a full-screen VHS back in the 1980s. Now Kino Lorber unveils a widescreen Blu-ray of this long-sought thriller from Siegel's great late era, when he signed his output with the onscreen phrase "A Siegel Film", the first words we see on this print; it's also the title of his autobiography (Faber & Faber, 1996). The opening credits are distinctive. As we hear a boys' choir singing Glenn Miller's "The Chestnut Tree", itself an old chestnut, we see a series of photographs of two boys playing in the English countryside. The scene is bucolic and idyllic. The credits are superimposed with the names spelled out in colored wooden blocks. At last the boys are in motion, and no sooner do they cross a wire fence with their large model airplane than a military jeep comes barreling at them so quickly, we're afraid it may hit them. The soldiers take the boys into a dark hangar where two more people in uniform wait: a man and a beautiful woman with chic blonde hair. For a moment, it seems the boys will be sent back to their boarding school. Then a series of disorienting jump cuts make it clear that something bad is happening, as the boys are rendered unconscious and whisked away in a van. The only thing to become clear is that everybody's been acting a role, except the boys, and even they were kind of playing soldier with their plane. Their play was interrupted by adults playing at soldiers. Perhaps everyone in the world is still enacting their childhood fantasies of pretending to be grown-ups. Then the ruthlessness of the lead couple is demonstrated by eliminating their two assistants on the highway via exploding jeep. In the next sequence, Michael Caine comes to the door of a house in the role of a recently paroled convict in search of a friend who promised him a job. The woman who answers the door is the same beautiful woman from the previous scene, now identified as Ceil Burrows and clearly in the middle of a busy day. She's played by French actress Delphine Seyrig, an icon of beauty and intelligence whose presence has graced a variety of masterpieces by Alain Resnais, William Klein, Francois Truffaut, Jacques Demy, Luis Buñuel, Chantal Akerman, Harry Kümel, Marguerite Duras and Ulrike Ottinger. At the time of Siegel's film, audiences were most likely to know her from Fred Zinneman's The Day of the Jackal (1973), a film that defines (and surpasses) the sort of modern spy-suspense film that Siegel is making here. As German film historian Mike Siegel (no relation to Don) explains in his commentary, Universal had wanted Siegel to use that film's star, Edward Fox, but he decided to go with Caine. If our first glimpse of Caine is a seedy one, that's quickly replaced by the knowledge that instead of being an ex-con, he's actually Major John Tarrant of MI-6, and he's supposedly pulling the wool over Ceil's eyes. Except we already know what he doesn't -- that she herself is acting a role in order to trap Tarrant into being photographed by her boss or lover or whatever he is, the phony officer from the kidnapping: McKee (John Vernon). Acting or role-playing is a primary theme of the film, although nobody spells it out. In virtually every scene, the characters are either acting or suspected by others of acting. We receive the impression that almost no human behavior or interaction can be authentic, as though the world foreshadowed in Siegel's Invasion of the Body Snatchers (1956) has arrived. This is a common theme in espionage films, of course, and that's the territory we're in. In Siegel's next spy thriller, the splendid Telefon (1977), seemingly ordinary Americans don't know they're not who they seem until their latent selves are robotically triggered by poetry, but that's for another day. The parallax of the plot strands finally emerges: one of the kidnapped boys is Tarrant's son, and the ransom involves a packet of diamonds acquired by Tarrant's boss, Harper (Donald Pleasence), who continually brushes his mustache and looks ferrety. The boy's mother is Tarrant's estranged wife Alex (Janet Suzman), whose role gradually deepens and sympathizes from distraught harpie to active participant in getting her son and possibly husband back. The turning point is signaled when she understands her husband's secret message, a throwback to a happier time when the family saw The Sound of Music (1965). It might feel strange for The Black Windmill to refer to The Sound of Music, as accomplished by a canny use of the name Trapp, but that movie was also about a family having to evade the authorities. The Black Windmill fits into its era's paranoid spy thrillers, those presented as sleek and suspenseful while aiming for a grimmer, grittier vibe than James Bond; the dialogue even makes a joke about Sean Connery. As we've indicated, however, this film runs along the lines of The Day of the Jackal or Sydney Pollack's Three Days of the Condor (1975) without quite hitting that level. 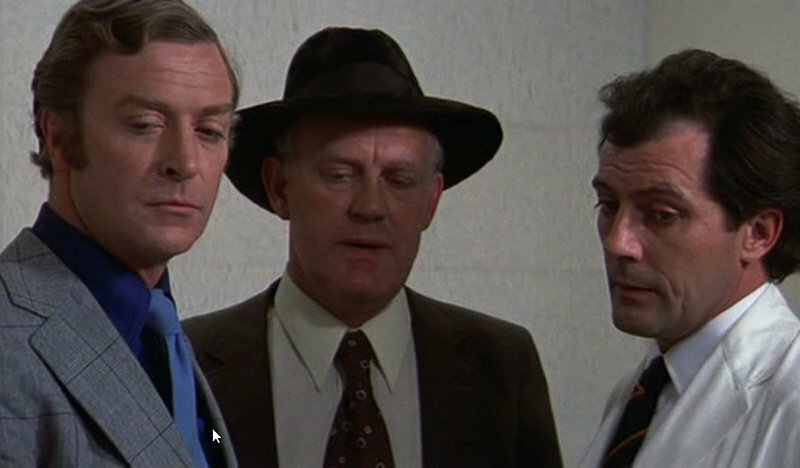 Since Caine plays a man determined to go through anyone in the name of his offspring, some viewers may be reminded of Mike Hodges' Get Carter (1971), although Tarrant is a more restrained, clockwork figure. While we're at it, the fact that this spy plot crosses the Channel and features an exciting climax inside a windmill may evoke Alfred Hitchcock's Foreign Correspondent (1940). Scripted by Leigh Vance from Clive Egleton's novel Seven Days to a Killing, the production was marked by script problems from a writers' strike and by a narrowly averted tragedy with a stuntman in the windmill scene, as discussed by Mike Siegel and in a bonus interview by director of photography Ousama Rawi. Rawi had just worked with Caine in Hodges' Pulp (1972); he's recently shot the TV series The Tudors and Borgia. His photography is among the most attractive elements of The Black Windmill, along with Roy Budd's music and the familiar cast of British troupers, both male (e.g. Joss Ackland, Clive Revill, Denis Quilley) and female (Catherine Schell, Joyce Carey, Hermione Baddeley). As Tarrant is put through his paces as a cat's paw in a series of embedded counterplots so complex that the story never reveals all its cards until the last sequence, the viewer is engaged by the tension between the straightforwardly staged action in real locations, the no-nonsense nature of the nonsense, and the murkiness of what's going on and whom we can trust. This tone reflects the post-John Le Carré world of bureaucrat-spies taking meetings and the larger 1970s context of sourness and pessimism regarding official institutions charged with maintaining law and order. Although the film is set in England, it's saturated in a Watergate vibe of tapped phones and weary middle-management. Kino Lorber's transfer, licensed from Universal, looks very attractive. The package calls the film unrated, though it was PG at the time. The Black Windmill may not be among Siegel's best, but it delivers, and it's nice to have it around at last.